The 369 Gallery was founded by Andrew Brown in 1978. At the time, it was the only gallery exclusively dedicated to the promotion of young Scottish artists. Immediately after leaving Edinburgh College of Art in 1977, Andrew curated a series of exhibitions at the Saltire Gallery in Gladstone’s Land in Edinburgh’s Lawnmarket and the following year, rented Alison Kinnaird’s glass studio in a medieval building at 369 High Street. Thus the 369 Gallery was born . From the very start, without positive discrimination, the 369 Gallery showed equal numbers of male and female artists and this, the first of two memorial exhibitions to include a selection of memorabilia and paintings from Andrew Brown’s personal collection, is primarily devoted to paintings by the female artists who exhibited at the 369 Gallery during the 1980s. These artists are now considered to be the “Grandes Dames” of Scottish art: Joyce Cairns, Pat Douthwaite, Carol Gibbons, Lil Neilson, Sheila Mullen, Margaret Hunter, June Redfern, Fionna Carlisle and Caroline McNairn. In 1984, the 369 Gallery received Scottish Arts Council funding and, with the help of an enthusiastic board and fundraising committee, which included Diana Milne (Chairman), Roddy Martine, Annabel Younger, Arthur Watson, Sylvia Stevenson and Douglas Hall, the Gallery acquired a derelict three storey Georgian warehouse in the Cowgate. This building was renovated into two floors of gallery space, an education suite for art classes, artist studios, the Gilded Balloon Theatre, and a restaurant, starting the gentrification of the area. 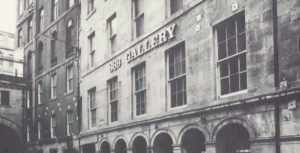 The 369 Gallery always encouraged an international outlook, believing that modern Scottish art had only ever been truly appreciated at home after acclaim abroad and so, in 1982, it became the first British gallery to take part in the prestigious Chicago Art Fair. This led to a series of successful exhibitions in Chicago, New York and Santa Fe. In 1991, following a debacle with the Scottish Arts Council, Andrew Brown departed the gallery to paint and write in the Scottish Borders. Occasional exhibitions still took place in the Cowgate building and the artists’ studios continued to be occupied, but the primary tenant was the Gilded Balloon Theatre which became a notable festival venue until a disastrous fire destroyed the area and burnt the gallery to the ground in 2002. However, as Andrew Brown said at the time, “the 369 Gallery was an idea, not a building” and the concept briefly rose from the flames in the noughties as the Phoenix 369 Gallery in Dundas Street, similarly promoting contemporary Scottish artists.